1 LAB 9 Finishing the project! 5 Using Mass Spectrometry (MALDI-TOF MS) to Identify and build a library of soil isolates. LAB 9 Finishing the project! This is your last wet lab! After you have recorded all your results on a lab Google Doc, you need to freeze your isolates. Once these steps are completed, please discard all cultures. You will receive 5 "clean-up points" the week afterr Lab 10 if we do not find any evidence of your cultures or tests and all 4 of your isolates are clearly labeled in the freezer rack. If we have to discard and clean-up later after you, you will not receive any of those 5 points. Cellulose medium: The red color of the medium provides increased contrast between the cellulose containing medium and the halo or clear zone that indicates that cellulase has diffused out of bacterial producers and degraded the cellulose in the immediate vicinity. PVK medium: Look for a clear zone around the inoculum indicating the phosphate in the medium was solubilized and processed by enzymes secreted from the bacteria. Starch Medium: Flood the plate with Grams Iodine. Let the plate sit for at least 10 minutes, longer is fine. The plate should turn dark blue as the iodine binds to the starch. Pour off the excess iodine (into paper towels in the biohazard bag on your bench) and wait until the remaining liquid is absorbed by the plate. Look for the presence of a clear halo around the inoculum site indicating the presence of amylase. Please complete the Google doc prior to freezing your isolate. After you have recorded all your results, follow these instructions (also found in protocols) to freeze your isolates. Try not to freeze/thaw your glycerol stock too many times. If you need to thaw frequently than make a new glycerol stock replacement from a freshly grown culture. Introduction: The Bruker MALDI Biotyper utilizes various organic acid solutions to: 1) prepare the Bacterial Standard (BTS) and HCCA (matrix): 2) complete the Formic Acid Extraction process; and 3) to clean the Polished Steel Target. Principle: In some microorganisms it may be necessary to break down the cell wall and separate the ribosomal proteins prior to spectra analysis. Always use chemicals of the purest quality for the extraction procedure. Fresh Microorganism: overnight growth should be used for routine microorganism identification; slow-growing bacteria may need to cultivate for several days before testing; do not use organisms that have been stored at 40C or lower as this has a negative impact on quality of spectra and reproducibility; storing plates at room temperature for several days is acceptable; different media types and growth temperatures have little effect on results. 2. Transfer a large, single colony of microorganism to the tube (more than one colony may need to be transferred if microorganism is small you want the solution to be opaque/cloudy; chose isolated colonies OR, if using broths, spin and wash (HPLC water) 2-3x to remove media)); Vortex thoroughly (1) minute. 3. Add 900 μL of Ethanol; Vortex thoroughly (1) minute. 6. Remove ALL excess Ethanol with pipette (tubes may be left at room temperature in the biological hood, or spun more than once, to complete the evaporation process if necessary, all the ethanol must be gone before the next step). 7. Add 50 μL of 70% Formic Acid (if only a small amount (size of pellet) of microorganism is available decrease the Formic Acid volume to 10 μL). 8. Vortex thoroughly 1 min and let stand for 5 minutes. 9. In the chemical hood and WEARING GLOVES, add 50 μL of 100% Acetonitrile (if only a small amount (size of pellet) of microorganism is available decrease the Acetonitrile volume to 10 μL); vortex thoroughly (1) min; NOTE: the volumes of 70% Formic Acid and Acetonitrile must be equal volumes. (see Formic Acid Extraction Solution 2). 10. Centrifuge at maximum speed (13,000 to 15,000 rpm) for (2) minute –(continue with: MALDI Target Preparation). Bacterial Test Standard (BTS) 10 mg/ml (w/v) is used to calibrate and test software, use fresh on every plate. The BTS will be provided in lab ready to use. alpha-Cyano-4-hydroxycinnamic acid (HCCA (MATRIX)) (from Bruker, Fluka, Sigma) Bruker Product number 255344:. The reconstituted matrix will be provided in lab ready to use. Fresh Microorganism: overnight growth should be used for routine microorganism identification; slow-growing bacteria may need to cultivate for several days before testing. Do not use organisms that have been stored at 40C or lower, as this has a negative impact on quality of spectra and reproducibility; storing plates at room temperature for several days is acceptable. Different media types and growth temperatures have little effect on results. PREPARE CULTURES FOR MALDI USING FORMIC ACID EXTRACTION IN LAB. 1. 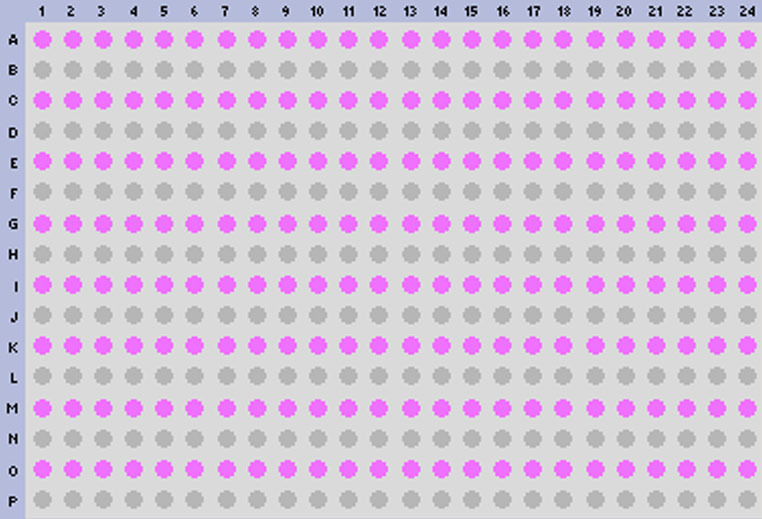 Prepare a MALDI Target Worksheet with appropriate sample identification, assigning the first two target spots for BTS (QC) and the rest for each isolate to be analyzed. 2. Inoculate 1 µL of each Isolate Formic Acid extract supernatant (avoid touching the pellet) onto the target spots indicated on the Target Worksheet. 3. Once all the isolate extracts are loaded. 4. One student will place 1μL of BTS on each of the 2 BTS spots. 5. Air Dry all spots at Room temperature. 6. Immediately after BTS spots (and all other spots) are dry, overlay all spots with 1 µL of HCCA (Matrix) (to avoid oxidation of the standard). Once the HCCA is uncapped work quickly to avoid evaporation!!! 7. Be sure the target plate is completely dry before placing the Target plate in the MALDI-TOF. 8. You are ready to analyze your isolates using the MALDI-TOF MS. Using Mass Spectrometry (MALDI-TOF MS) to Identify and build a library of soil isolates. Using log phase (24 hour) cultures of your isolates you will learn how the MALDI-TOF Biotyper works to identify your microbes and to begin a "library" of soil organisms. You need freshly grown cultures of your isolates today made 24 hours prior to this lab. If you have one or two very slow growing cultures, you need to allow enough time to have a small but visible colony on your plate. NOTE: You will be provided with the instructions for using the MALDI-TOF and Biotyper in lab. A short survey about technique of Bruker microflex LT MALDI-TOF mass spec. TOF for Time of Flight. MALDI-TOF The samples which are measured for MALDI Biotyper application are typically the Proteins of Bacteria, Fungi and Yeast. The mass and distribution information will be used for identification. By firing with a laser (on microflex a nitrogen uv laser with a wavelength of 337 nm) on the prepared matrix-sample compound the matrix will be vaporized. The sample will be entrained and ionized. The matrix and sample ions will be accelerated in an electrical field as the target plate is under high voltage of up to 20 kV against to an arranged ground potential. To avoid influences of temperature, mechanical and electrical deviations and special techniques for acceleration the instrument needs to be calibrated before measuring unknown samples. To do this a mixture of known samples will be measured and an assignment between flight time and theoretical mass will be done. Amongst others the achievable resolution depends on the speed of the detector and the speed of converting the analog signals to digital signals. On microflex a 500 MHz digitizer which achieves a distance from 2 ns between data points (in 2 ns the light covers a distance of just 60 cm) is used. With a special digitizer function provides actually a calculated ‘pseudo’ 2 GHz sampling rate. Mainly influencing variables are also the applied laser energy, the drift distance and the electrical field distribution. The mass resolution for a single peak is calculated by dividing the peak mass by the Full Width at Half Maximum (FWHM). The resolution value can be checked in flexControl and flexAnalysis directly. Linear mode The ionized sample will be accelerated in an electrical field between the target plate and the acceleration electrodes. Followed by ‘drifting’ to a field free region and finished by hitting the detector. The first MALDI-TOFs have been used continuous extraction to accelerate ions. Between target plate and ground plate is a static electrical field which accelerates the ions immediately after generating. Next step was to use a delayed extraction to accelerate ions (pulsed ion extraction - PIE). Between target plate and ground plate a second potential plate (P2) is placed to modify the electrical field. The P2 plate has the same potential as the target plate. So no acceleration will happen after generating the ions. After a delay time, the P2 potential will be decreased and the acceleration starts. The fortune is that the effect of loosing resolving power because of different kinetic energy of equal ions will be reduced. A higher resolution for a small mass range can be observed. A further advancement could be reached by optimizing the pulse shape applied to the P2 plate. With the now called PAN (panoramic) mode a high resolution over a brought mass range will be reached. The ion lens is located on ion optic behind the acceleration electrodes and applies a small vectored electrical field to focus the ion cloud for better resolution. The P1 (IS-1) potential (Target plate) is connected to the PIE electronic J497. The P2 (IS-2) potential is connected to the PIE electronic J495. The Lens potential is connected to the Lens power supply J480. Graded Assignment: Study for your Lab Practical and submit a complete draft of your final paper'. Continue to wind down and complete your work on your isolates. Discard and clean up any remaining tests and cultures on your isolates. Note that there are 5 bonus points awarded for perfect clean-up. Your instructor will explain the "rules" for obtaining these bonus points. This page was last edited on 16 April 2013, at 11:21.